I will put this notice on my post from now on, every time that I copy a post from Facebook, so all of my readers will know that this is not my work, but that of someone else. This, like so many of my posts have, came from Facebook. This was on my Facebook today and came from Courtney Luper‘s photo, and recipe. It sounds and looks delicious. Out of the thousands of recipes I post, this is the most requested! Thought I would re-post it. 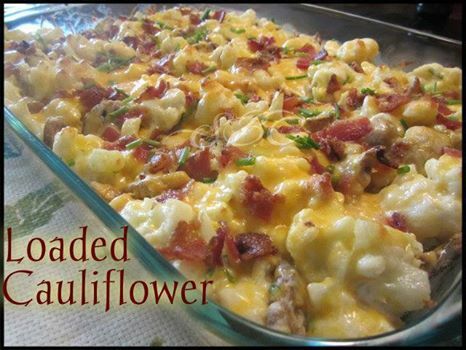 In a large bowl combine sour cream, mayo, 1/2 of crumbled bacon, 3 tbs chives, 1 cups of cheese,mushrooms(optional) and cauliflower and mix well… place in baking dish and cover with remaining 1 cup of cheese and rest of bacon crumbles. Bake for 15-20 minutes until cheese is melted. top with remaining 3 T chives and serve. This entry was posted in Good Edibles From Other's Recipes and Ideas, Other People's Recipies And Pictures on January 12, 2015 by bonnie.